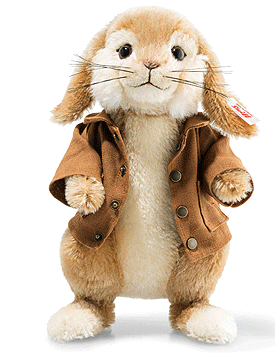 Benjamin Bunny by Steiff. A beautiful limited edition Steiff item, hand made in brown and cream mohair. This very special limited edition piece, has the white ear tag and the trademark Button in Ear - gold plated. Worldwide Limited edition of only 2000 pieces. Season launch: Autumn 2018 CAUTION! This product is not a toy and is intended for adult collectors only.